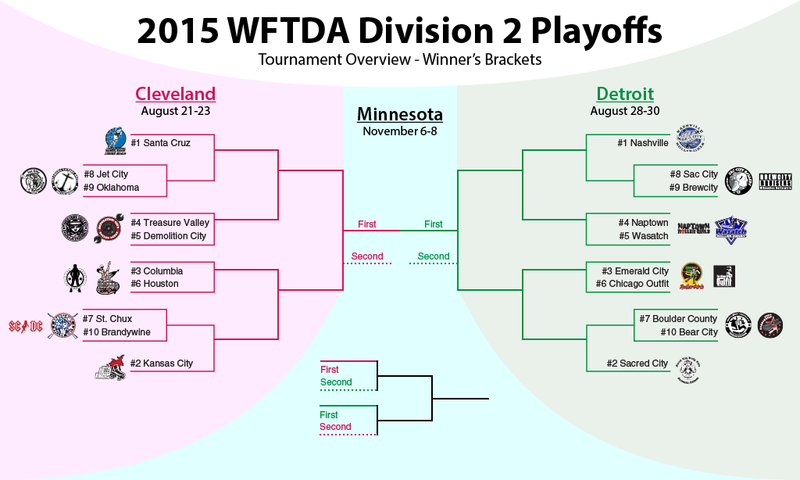 It’s WFTDA playoff season! A total of 60 roller derby teams from around the globe have been divvied up into two competitive divisions and assigned to one of six playoff sites around the country. Only a select few will make it to Minnesota and the WFTDA Championships. Division 2 play will kick things off. In just a few years, the D2 playoffs have made a name for themselves for featuring many close games. Packing a lot of closely-ranked teams together in the same bracket, like sardines in a can, tends to do that. Last year, over 40% of all D2 games played resulted in a score difference of 20 points or less, including a 1-point thriller in the 2014 third-place game. The rank score difference between the top and bottom seeds are the same this year as they were last year, so there’s a good chance this trend will continue. A new twist for 2015 comes in the form of what happens when the Division 2 finalists get to St. Paul. Previously, the two tournament winners would move on to face each other for all the marbles, and the two runners-up would fight for third. Now, the bracket winners must play an extra game for the right to play for the D2 trophy, as the winners and runners-up will cross over and play each other first; the victors of those games will then play for the gold. Our big Division 2 bracket, an overview of the path all 20 teams must face—and stay on—if it wants to clinch the title. Where’s your favorite? We’ll start our playoff preview coverage with what’s happening in Cleveland, Ohio this weekend. If you want to watch the games live, you’ll need to head on over to WFTDA.tv. They’ve got each of the two D2 tournament weekends on streaming PPV for $12 each. Full game schedules, the full tournament bracket, and ticket info can be found here. Santa Cruz comes into the playoffs on the back of a very strong regular season. Three of their wins (Madison, Steel City, Arizona) were against teams in the Division 1 playoffs. Their two losses were big ones, but they would be against the likes of Angel City (-259 points) and London (-291). Those results weren’t enough to return the team to D1 this year, but it’s got the inside track to make it to Championships. Flat Track Stats, which does a good job gauging a team’s current strength, ranks Santa Cruz higher than any other team in the Division 2 playoffs. Within the Cleveland bracket, it puts them 17 teams clear of the 2-seed. That’s as easy as anyone has it—if you can say that about anyone in D2. Back when the WFTDA still had regions, Kansas City was a regional powerhouse and regular participant at WFTDA Championships. But the past four seasons have seen KCRW slowly slip in the rankings. This year will be the first time the team will be competing in the Division 2 bracket. Though seeded #2, KC has had a relatively weak season, not beating anyone ranked higher than them—though they came close against #32 Toronto, losing by 3 points—and merely splitting two games vs. lower-ranked Chicago Outfit. It also lost a game against Houston by 74 points—the same Houston that may potentially meet them in their second game. Despite never being ranked in the WFTDA top 40 at the June 30 rankings cutoff, Columbia has been in the Division 1 playoffs the past two years due to juuuuuust enough teams ahead of them declining to participate. (The team was playoff-ranked 41st in 2013 and 44th in 2014.) This year, lady luck has finally turned against the QuadSquad, and they’ll have to settle for the competition in Division 2. ‘Lumbia has just one win against a near-skill opponent, a 55-point victory over 10-seed Brandywine. That’s not much to go on for a seed as high this team is, nor is the 3-game losing streak it is carrying. Before heading to Cleveland, the QuadSquad dropped games to Nashville, Chicago Outfit, and Steel City. No better time to break that streak than the first game of the playoffs! Not many teams can say that they beat a WFTDA champion. Treasure Valley is one of those teams. In #25 @OlyRollers' first #wftda game in about a year, they fell to #47 @TVRDerby 219-204. Okay, so the Oly Rollers are a few totems lower on the pole than they used to be. But still! Beating a Division 1 team is a nice feather in TVRD’s cap. A 34-point win over nearby Jet City earlier in the year also looks good, and is more relevant since Jet is the 8-seed in this tournament. Also relevant: A 101 point loss to 6-seed Houston. Oof! Demolition City hasn’t found the win column often this year, but their losses have all been against tough opponents. Their best performance was a 189-183 loss to #31 Arizona in April. Demo also took on D1 teams Ohio (-33 points), No Coast(-15), Steel City (-59), and Detroit (-160). If you’re going to lose games, you might as well do it against competition that’s slightly out of your league. That’s just as good for training as it is for your WFTDA ranking points. Houston holds the distinction of having played the most games against the other teams in this bracket, including the top two seeds. In March at Clover Cup, Houston beat 2-seed Kansas City 251-177. A few months ago at Midwest Brewhaha, the team ran into both Treasure Valley (a win) and the aforementioned Santa Cruz (a loss). That loss against Santa Cruz, however, saw a final score of 201-171, only a 30-point difference. Though Houston’s WFTDA and Flat Track Stats rankings are mid-pack, their recent results might suggest this is a stronger team than they appear to be on paper. If they can beat Columbia and stay on the winner’s path, Houston may once again run into KC and Santa Cruz. If that happens, watch out! The ladies from O’Fallon, Mo. are back for some more Division 2 action, looking to repeat their podium finish from last year. The team will have a bigger hill to climb this year, slipping a bit in the rankings after winning one game of significance (an 84-point thumping of #60 Brewcity), though close losses to Naptown (-12) and Nashville (-14) did help. Not helping: Moderate losses to nearby teams in the Cleveland bracket. St. Chux lost to 5-seed Demolition City twice (-66 and -63), and the 9-seed Oklahoma Victory Dolls once (-47). Had other games gone a few points differently, the Derby Chix might have landed in an unfavorable rematch; instead, they draw the low seed in the first game of the playoffs. Ouch! No sanctioned wins on the season for the 2013 Division 2 Champions. Jet’s best showing was a 34-point loss against Treasure Valley, the 4-seed in the bracket. With triple-digit losses against Seattle-area neighbors Rat City and Oly, and having only played the minimum number of games played this year to qualify for the playoffs, it’s hard to pin down exactly where the Bombers stand this year. Oklahoma comes into Cleveland with a four-game winning streak. Granted, the last two were 300-point blowouts over lowly teams. But there was that 47-point win over St. Chux, a team that it may inevitably run into down in the loser’s bracket. Flat Track Stats has the Dolls tracking much higher than their WFTDA rank would indicate; one spot behind FTS#46 Kansas City, in fact. (Never mind that 99-point loss to KC earlier this year.) The odds are good that OKVD can at least get out of the opening round with a win. They made it! As the last team into the playoff party this year, it’s already a winner. Brandywine was a winner last year, too, grabbing a playoff win in 2014. If they want to repeat that feat in 2015, they are going to have to get out of the basement quickly. The highest-ranked team Brandywine has beaten is #76 Green Mountain, but that was only a 26-point victory. Their game against #80 DC Rollergirls was even closer, a 14-point win. If you’re having difficulty beating 20 ranks beneath you, it’s going to be a lot tougher doing it against your peers. Still, one would think a team with nothing to lose will play like it on the track. With how wild and unpredictable the Division 2 tournaments can be, maybe that can be the difference! 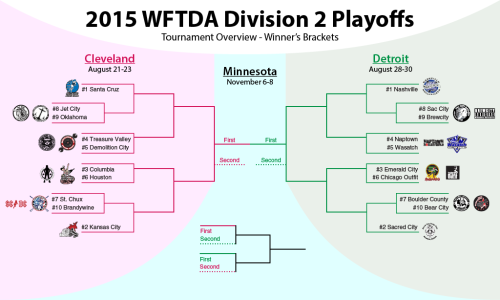 Previous PostWFTDA Championships Final to be Carried on ESPN3 in U.S.Next PostWFTDA Division 2 Playoffs: Detroit Also Rocks!